Happy Holidays! I hope you are all having a wonderful holiday season and I would like to share a sketch and some inspiration. 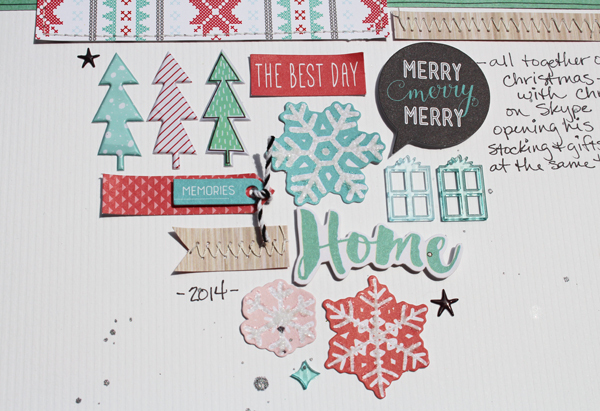 Christmas Eve was Sketchy Thursday at Scraptastic Club Blog and although I know most of you have no time right now to scrapbook, maybe just taking a break for some inspiration will be nice. I love the acrylic present shapes and the little puffy trees. There are just so many cute elements in this kit. The glittery Thickers alphas made me want more sparkle so I used some Stickles glittery paint for the snowflakes.